How can the Cloud Classroom support students with a Universal Design for Learning? Facilitating a classroom in which all learners have the opportunity to improve their practice means to incorporate the principles and practices that are described by the National Center on Universal Design for Learning. Learners have varying visual and auditory needs and may need access to the "what" of learning in multiple formats. 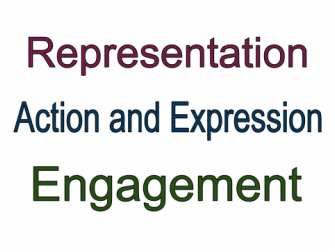 Offering written, spoken and visual representations through a variety of technologies provides students the opportunity to access and re-access information through different means so they may process information and make connections in the way that suits their learning best. Cloudware offers easy access to video, text and audio versions of content, both outsourced and created by the teacher. Not every learner needs to produce the same culminating product. Learning and understanding of concepts can be shown in a variety of ways. Facilitating learning for a group of learners, must allow for each individual student to express their learning in the optimal "how" option for their individual learning needs. By incorporating this concept into the design of the curriculum, the facilitator can focus on assisting the student in identifying their own learning outcomes. The increase in free cloudware production and presentation tools allows for a variety of outcomes. Student ability and readiness to work in various contexts also varies -- the "why" that engages one, completely disengages another. Allow students to choose between a set learning routine or to follow a more spontaneous learning path; allow students to choose between group or individual learning; and allow them to reassess their choices. While educators may have goals for students to achieve, like goals are achieved via routes and timelines that align with the individual not the entire class. Access to cloudware in and outside the classroom offers not only a variety of engaging tools (something for everyone), but also the ability to alter the context of learning from independent to interactive for different students in the same unit of learning.